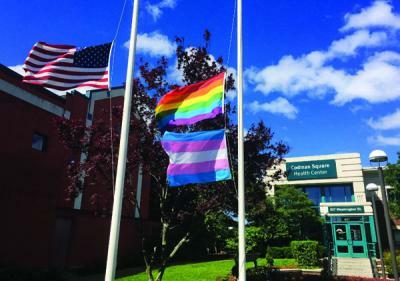 Orlando massacre aftermath: Flags flew at half-mast this week outside the Codman Square Health Center. Whether the carnage is close to home on a Dorchester street corner or in a darkened Florida dance club, there’s a maddening synergy to the gunfire that is terrorizing American cities: The irrational intransigence of the political-industrial gun complex that reflexively resists any common-sense provisions that might moderate the mayhem caused by an unfettered gun trade without undermining the Second Amendment. We’ve seen one presumed “tipping-point” after another come and go without Congressional reform, including— most horrifically— the slaughter of first-graders in Newtown, CT, in December 2012. Sunday morning’s assault on the Pulse Nightclub is the latest and, statistically, the heaviest toll in terms of casualties. But each mass killing by unhinged gunmen who mow down innocents with a weapon minted by our own hands for a foreign battlefield — whatever their motive— slices a new, harder-to-quantify wound on our national psyche. Each atrocity is followed by a now-hackneyed and grotesque sequence of breaking news alerts, mournful presidential press conferences, a recitation of victim names, “thoughts and prayers,” online petitions, and moments of silence. The subsequent absence of any actual lawmaking aimed at banning weapons of mass murder, tightening restrictions on sales to the mentally ill or potential terrorists, or even studying gun violence as a public health issue is a void filled only by word of the next mass murder. This lack of a rational response to what is clearly a mounting threat erodes our bonds of nationhood, much the way that other deeply divisive policy standoffs did in distant days. One thinks of how another national sacred cow— the “right” to keep another human in chattel slavery — once fractured our union. And how even modest attempts to seek a measure of moderation from slavers led never to compromise, but instead to division and, eventually, fratricide. This modern-day House Divided is fraught with similar fault-lines, although those intent on seeking moderation — this space included—profess no intent for outright prohibition of gun ownership. On the contrary, the right of citizens to bear arms can and should be preserved. Reasonable people on the left understand that guns can and will remain a part of our society and that— in the right hands— are essential tools of protection. We witnessed just such an example last month when a lunatic began slashing innocent people at a Taunton mall, killing three before he was put down by an off-duty officer with a sidearm. Just as it’s a fool’s errand to propose a ban on immigrants based on their religion, there’s no future for a prohibition of guns in the United States. But as Bay State Congressman Seth Moulton detailed in a stirring opinion article in the New York Daily News this week, untrained civilians have no reason to carry heavy assault-rifles around in our communities. Yet, they can, and do, with predictable results. There’s only one description for a country that cannot bring itself to institute common sense protections for its own citizens: a failed state. The ban on assault weapons must be restored.